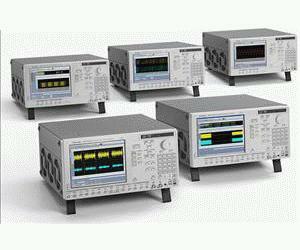 The AWG7000B Series Arbitrary Waveform Generator delivers a unique combination of superior signal stimulus, unrivaled sample rate, bandwidth, and uncompromised usability. This family offers the industry’s best solution to the challenging signal stimulus issues faced by designers verifying, characterizing and debugging sophisticated electronic designs. The direct synthesis signal generation enables a variety of signal outputs including multi-level, Pre/de-emphasis, Jitter (Rj, Pj, ISI, DCD), SSC, and wander elements. With sample rates from 6 Gsample/sec to 24 Gsample/sec (with up to 10 bit resolution), together with one or two output channels, the toughest signal generation challenges in the high-speed serial communication and wideband RF applications can easily be solved. The open Windows (Windows XP) based instruments deliver ease of use and allow unparalleled connectivity with peripherals and compatibility with third-party software.